We’re staying at the old Head Lighthouse Keepers House at Cape Otway, which has, through the tiny window, a view of Australia’s oldest surviving lightstation. Built in 1848 from sandstone quarried at the nearby Parker River, the lightstation was the first sight of land for thousands of immigrants after months at sea. It gets busy during the day as many Great Ocean Road day tours drop in for a visit or for lunch at the cafe. The cafe has a million dollar view from the enclosed verandah, straight down to the lightstation and Bass Strait beyond. The fresh scones are served with your standard strawberry jam and a small amount of thick cream. Our two-night stay package included two Devonshire Teas, so I got to enjoy them twice. A fabulous option is to stay overnight, as the area is different minus the crowds. Tea: A small pot of hot water to accompany a teabag and several choices of tea. Overall: A cream tea with a magical view is not a thing to miss. Along with my Devonshire Tea fetish, I must admit I have a penchant for lighthouses, and when I can combine the two I’m like a kid in a candy store. Not as isolated as Cape Otway Lightstation, Split Point Lighthouse is visible from the highway and only a few minute deviation. 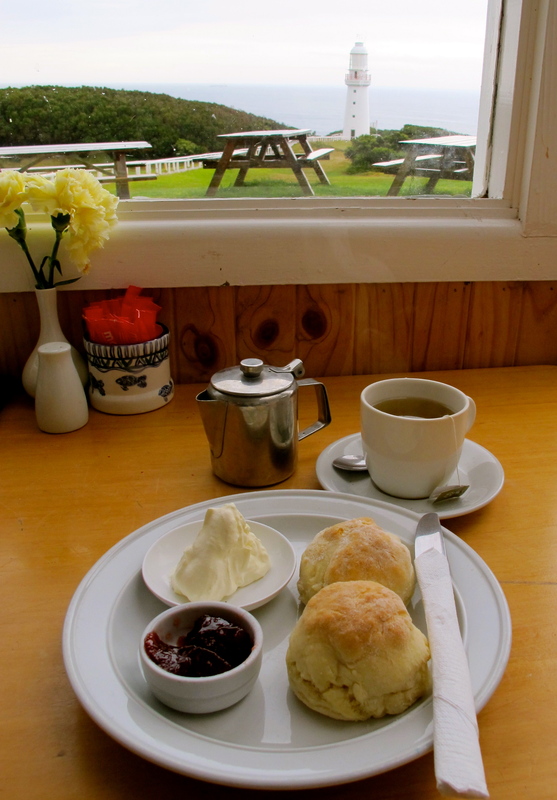 The Tea House is situated next to the lighthouse and is famous for its scones, so naturally they a lovely – crispy on the outside and fluffy on the inside. The raspberry jam is delectable but the cream slightly too light and too little for the large scones. Combine your visit with a 45 minute tour or just for the ambience and of course the scones! Tea: A variety of loose leaf teas. Overall: Cute and cosy with lots of interesting photographs from yesteryear. 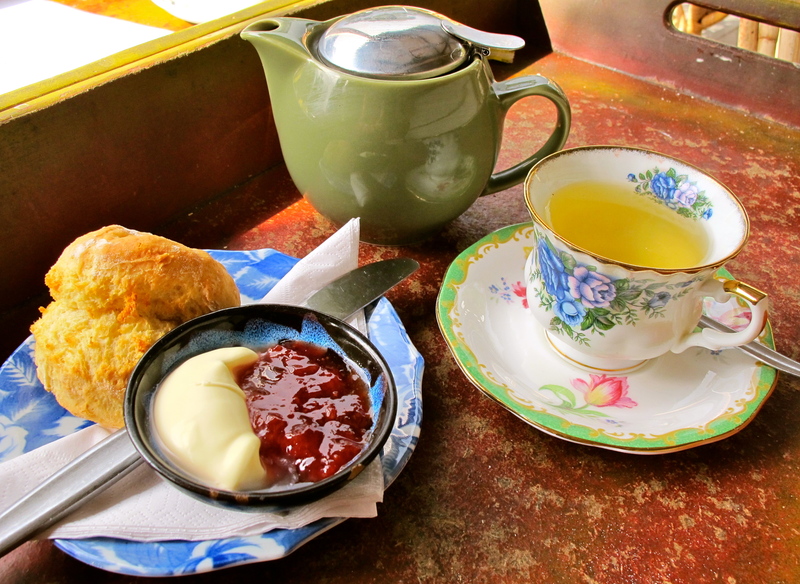 The River Tea House at the quiet end of Lorne is a small cafe that sits next to a gurgling stream and knows how to get all facets of the Devonshire Tea right. Comfortable outdoor seating, including rockers, they have a long list of loose leaf teas to choose from that’s served in a pot and sipped from a dainty tea-cup and saucer. Only one scone is served with both jam and cream sitting alongside one another in the same dish. The Gunliffe Waters Yarra Valley jam is tasty and thick and the cream of the double variety. The scone is fresh out of the oven, crusty on the outside and delicate on the inside. Mmmm. Put it on the ‘must try’ and ‘must stop at’ list. You won’t be disappointed. Tea: An amazing variety of loose-leaf teas, as it should – it’s a tea house! Overall: Funky and away from the hustle and bustle of Lorne. OK, I’ve just found that you know all about it!! What about Flagstaff Hill Maritime Village Warrnambool? 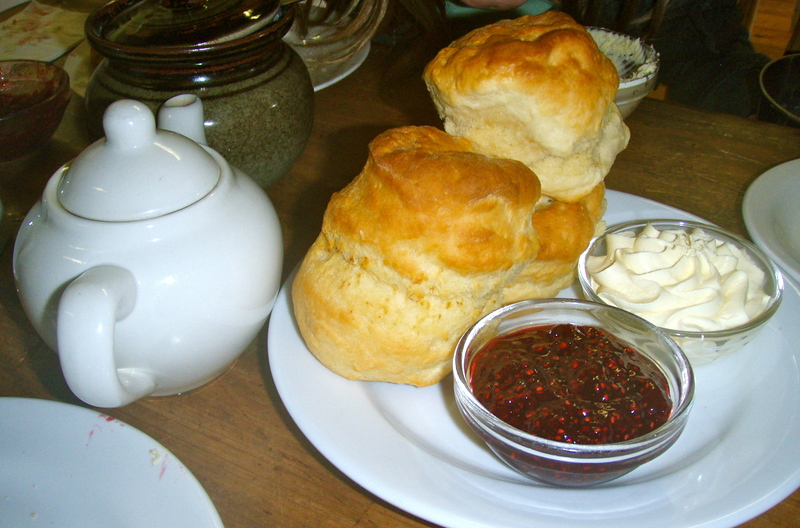 Scones made on site, local jams and cream and we have our own tea blend. I’ll try and get there, thanks for letting me know Peter.